All transactions are safe and secure with a reliable history in online purchasing behind each of our associates. 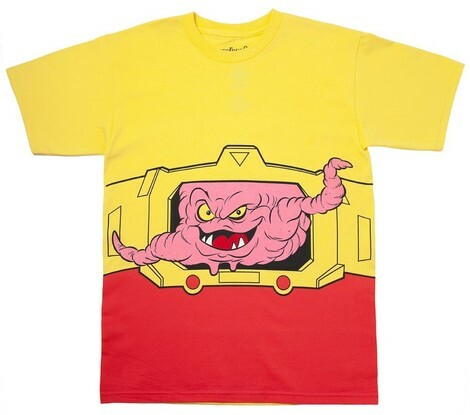 Buy the Krang Costume t-shirt to own TMNT clothing and merchandise. When you think of a villain, you think of a person but that isn't always the case. Krang is a brain in a human shell that was banished from his own land, Dimension X. He has teamed up with Shredder to take the turtles down since neither have had success individually. The two take shelter in a subterranean round tank called the Technodrome to plot out their upcoming plans of attack. Purchase this or a Krang hoodie designed to look like the human shell he navigates around in. If you prefer his ally, check out the Shredder hoodie costume with built in face mask and spikes that are sure to catch everyone's eye. In addition to the Krang Costume tee above, browse the TMNT Clothing Gallery for more apparel like men's and women's clothes, kids shirts or hoodies.